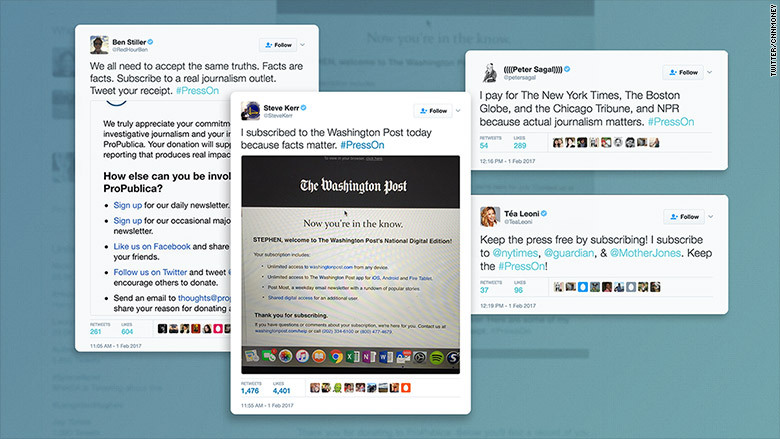 Support for news outlets in the Trump era is coalescing around a catchy hashtag: #PressOn. Reporters, activists and Hollywood stars like Mariska Hargitay and Ben Stiller started to promote #PressOn Wednesday morning. "The very concept of truth is under siege, so journalism is more important than ever. Subscribe to an outlet & tweet your receipt," Jordan Brenner tweeted to kick it off. Brenner, who works at the sports web site Bleacher Report, crafted the pro-subscription campaign with about 30 other journalists and writers. There has been a "group message chain going back and forth for days," Brett Michael Dykes, the editor in chief of Uproxx, told CNNMoney. He said #PressOn is an effort to encourage personal investments in journalism: "We all reached out individually to people we know with large followings who are politically active on social media and politely asked them to help spread the word. Simple as that." Celebrities gave the hashtag a Twitter boost. The actress Minka Kelly said she subscribed to The New Yorker, The New York Times, and the Washington Post. Golden State Warriors coach Steve Kerr, a vocal Trump critic, said "I subscribed to the Washington Post today because facts matter." Related efforts broke out after Election Day, partly due to President Trump's frequent anti-media attacks. The New York Times and a number of other national news outlets have been an uptick in subscriptions. Nonprofits like ProPublica have seen a spike in donations. But there are concerns in journalism circles that the subscription boon isn't benefiting regional and local newsrooms. Some people who tweeted about #PressOn specifically said they were supporting other kinds of media outlets, beyond the big dailies.